The fourth step is a follow on to the last one: Pick a format for naming your images, rename them after deleting all the throw aways, and never, ever deviate from your chosen format. When you take an image, the camera assigns the image file a filename, e.g., _DSC5645.NEF and IMG_7689.CR2, and, when you import images, Lightroom uses the camera given filename for the name of the image. However, _DSC5645.NEF and IMG_7689.CR2 tell us nothing about the images; in fact, the filenames are meaningless outside of some other organizational talisman, e.g., a properly named folder. This is why it is important to name your images in some meaningful way. A filename doesn’t need to tell you everything about the image but it does need to tell you enough to know the general subject matter, e.g., London rather than the Tower of London, and where to locate it. As before with folder names, if you name your images consistently following some standard format, you will have an easier time finding your images later. My format is fairly simple and flows directly from how I name folders. My images are saved in a folder named with the date the images were taken and a short description, e.g., 2014-05-16_Mom’s 80th Birthday. I rename images, after importing, sorting, and deleting all the throw aways, with the date the images were taken, a short description (always the same as the folder name), my last name, and a sequence number to make each filename unique, e.g., 2014-05-16_Mom’s 80th Birthday_Zwit_0034.nef. As with folder names, the filename is created by using the four-digit year and two digit month and day the image was taken followed by a short description of the subject of the images; the hyphens and underscore are added for readability. By glancing at the filename, I instantly know something about the image, i.e., the date the image was taken and subject of the image. It isn’t important whether you use this scheme or another. What is important is that you develop a scheme and use it without fail. As with naming folders, whatever scheme you choose must do two things: (1) be easy to follow and (2) make it easier to find your images. Click on the File Naming drop-down menu and click on Edit… See Image 1 below. Figure 1: Rename window with the File Naming drop-down menu. The Edit… option is at the bottom of the drop-down menu. 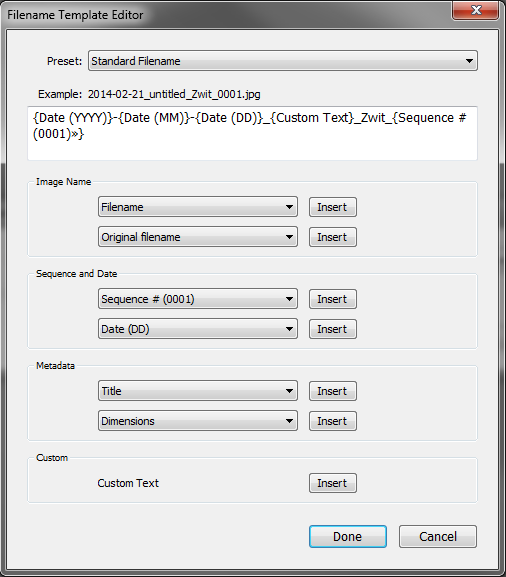 Figure 2: Filename Template Editor with Brian’s Standard Filename template displayed in the text box at the top of the window. 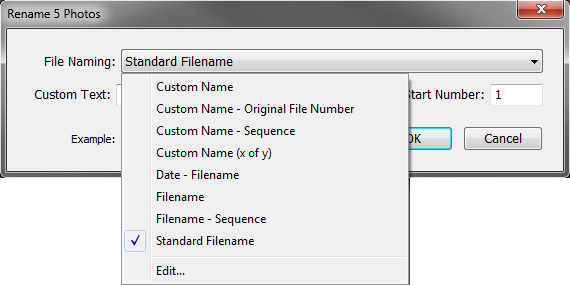 Figure 3: Rename window with the Standard Filename template selected. Note that custom text, in this case a description, can be added when this template is selected; if a template doesn’t contain a Custom Text tag, you can’t enter custom text. If you name your folders and files consistently and in way that makes them easier to find, you will be able to retrieve specific images quicker than if you leave the file names as they come out of the camera. And, the great thing about Lightroom is that you can automate renaming the image files with a template. So, there really isn’t any excuse for not being able to find any image quickly. Editor’s Note: In early May, Brian started a series of ten posts each outlining one or more simple but small things you can do to speed up your Lightroom workflow. This is the fourth post in that series; the first post was about how to efficiently manipulate Lightroom’s interface to reduce clutter; the second about the improving your efficiency inside Lightroom by using context menus; and the third about how to name folders. 27 May	This entry was written by School of Creative Photography and published on May 27, 2014 at 3:45 pm. It’s filed under Editing Images and tagged editing, lightroom, raw, workflow. Bookmark the permalink. Follow any comments here with the RSS feed for this post.